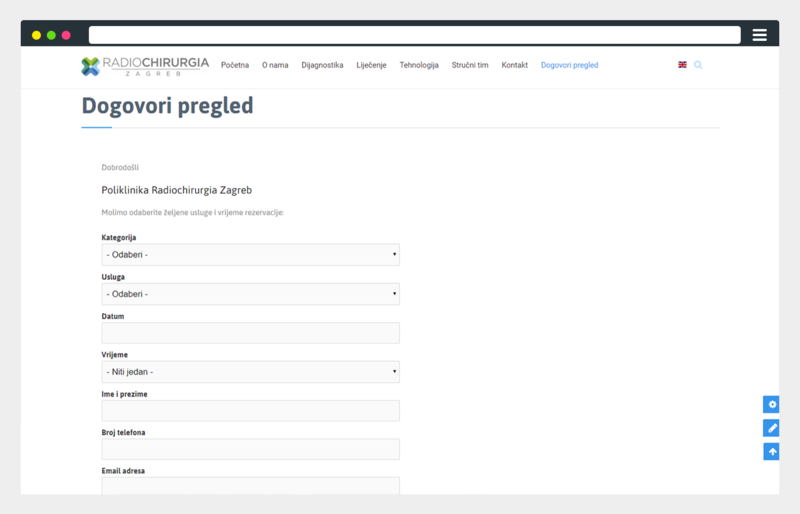 Perpetuum created a website for the Radiochirurgia Zagreb polyclinic. Aside from presenting the clinic and its work on the internet, the website also makes communication between the doctors and the patients easier and faster. 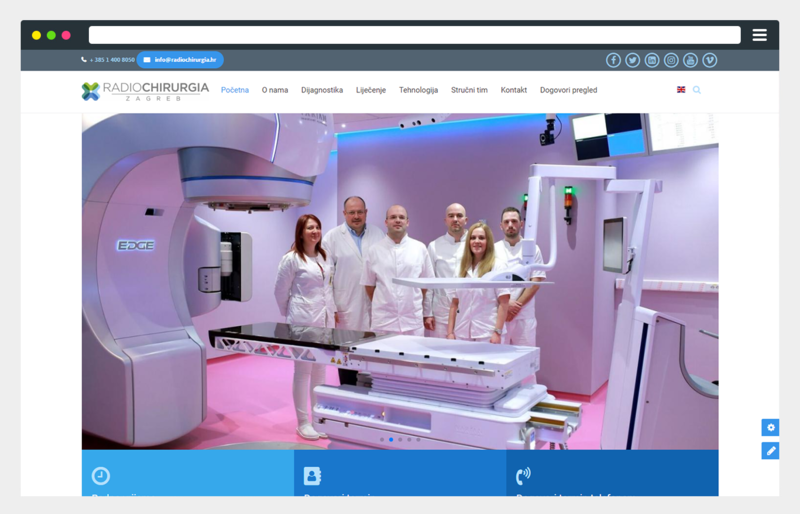 Radiochirurgia is among the most modern clinics for early detection and treatment of cancer in Southeast Europe, and experts who are working in the polyclinic are among the top medical experts not only in Croatia but also in the world. In addition to the best medical team, the speciality of Radiochirurgie is the technology used for diagnosis and treatment. The most modern radiotherapy and radiosurgery system of the American company Varian, for example, is being used by some of the world-renowned clinics such as Mayo Clinic and can be found in Radiochirurgia. What do Perpetuum and polyclinic Radiochirurgija have in common? Two things, actually: professional staff and the love for advanced technology. And what do we get when we connect the two teams? A pleasant working atmosphere with the same goal - to create a top, interactive website! In medical profession queues and documentation often cause inconvenience. But this is not a problem with Radiochirurgia. At the polyclinic’s website, we implemented the application form for the examination and we made it easier for you to load medical reports, X-rays, and other documentation. It not only speeds up the patient's treatment process but also gives doctors the ability to act as quickly as possible, which is crucial for the polyclinic of these capacities. We paid special attention to the security protocols related to the uploading of information to the website, thus ensuring complete trust between a doctor and his/her patient. For the system to function smoothly, it needed to be based on the Drupal CMS and iSite Open solution. Drupal proved to be an ideal platform as it provides users with the ability to maintain digital content without the intermediation of IT specialists and designers, and can additionally be upgraded to various components to meet the needs of the polyclinic in the future. A website is an important part of our communication with the clients and the public, but we primarily focus on our patients and treating them. That's why we really appreciate having team Perpetuum by our side; they make updating texts, photos, and other online content easier and more approaching. One less worry for us means we can dedicate more time, attention, and care to our patients!